When the moon's in the sky, and Venus goes "goodbye," that's an occultation. This has been a busy month for the moon. On Jan. 20, it traveled through Earth's deepest shadow to dazzle millions of skywatchers with a total lunar eclipse dubbed the "Super Blood Wolf Moon." And just days into the new year, the moon became host to a new visitor: China's Chang'e-4 lander, the first mission to the lunar far side. 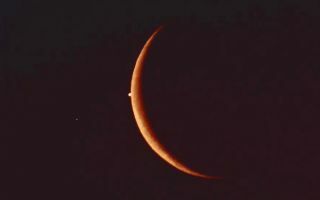 The moon will be a waning crescent when it appears to block Venus; according to timeanddate.com, it reached third-quarter phase on Sunday (Jan. 27) and the moon will progressively look smaller as the calendar approaches Feb. 4, when Earth's natural satellite will be invisible in its new moon phase. Venus is one of the brightest bodies in the sky, and on Thursday, it will shine at about its brightest with an apparent magnitude of minus 4.3. While skywatchers in the Polynesian islands will witness an occultation of Venus on Thursday (Jan. 31), the rest of the world will be able to see the two bodies in conjunction. They will be closest together at 12:37 a.m. EST (1737 GMT). The island nations in Polynesia will perhaps have the best view of Venus vanishing behind the moon, because in that part of the world, the occultation will happen in the morning around moonset. Western parts of South America, Central America and the southern Caribbean will also be in the path of occultation, but the event will occur in their afternoon. Below is a timetable for the occultation of Venus by the moon. Additional times are listed here. Sadly, the lunar occultations of Saturn and Pluto are happening during the daytime. That means their Feb. 2 occultations will be difficult if not impossible to view. Even with high-power telescopes in the darkest places on Earth, Pluto is notoriously difficult to spot. Further hindering Pluto's visibility, the dwarf planet reached a point in its orbit called solar conjunction earlier this month. This means that it's not only at its farthest distance from Earth, but it appears so close to the sun from our point of view on Earth that the distant dwarf planet is lost in the sun's glare for several weeks, according to in-the-sky.org. The best time to see Pluto this year will be when the dwarf planet reaches opposition on July 14. This year offers several more opportunities to view the moon passing in front of Saturn. The ringed planet will be at its brightest during occultation on Jun. 19 and Aug. 12, 2019.